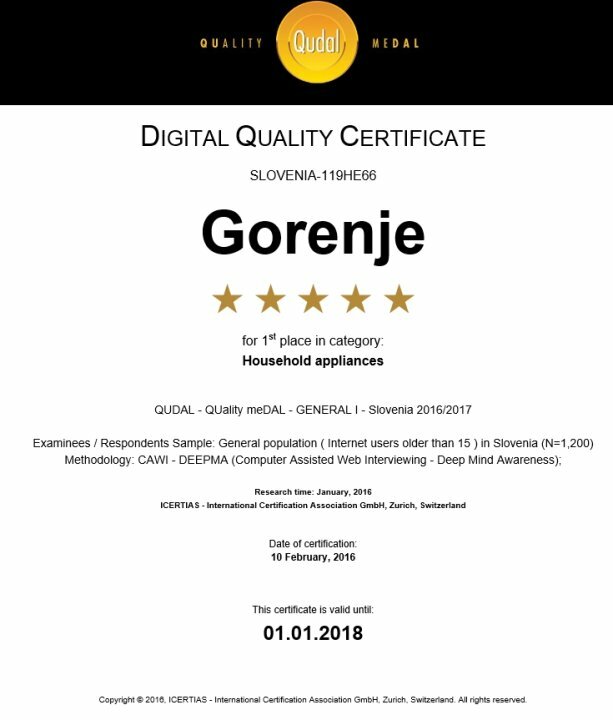 The QUDAL – Quality Medal research, performed in Slovenia in January 2016 by the Zürich based international organization Icertas, shows that in terms of quality Slovenians see Gorenje home appliances as the best. In the QUDAL – Quality Medal research Slovenians were asked which white goods and home appliance manufacturers in their opinion guarantees the absolute highest level of quality. In this category Slovenians have placed Gorenje on the top of the list. QUDAL research reveals the opinions of Slovenians on value and quality available to them and in what way they recognize and rate them. In the above mentioned research Slovenians were asked to name the products they would be buying and using if they had unlimited sources and quality was the only criteria for their purchases. Based on consumer opinion QUDAL Quality medal is a strong signifier of those subjects, products and services on the local market for which consumers believe to be offering the highest quality level. To ensure that all objectives are met, Icertias, in cooperation with partners, works on the development of international standards for the valorisation of high-quality products and services, measuring the price and quality ratio for each product or service purchased and defining the criteria for excellence in customer and client relations. Icertias' certificates QUDAL, Best Buy Award and Customer's Friend have become recognised by consumers on numerous markets in more than 40 countries on five continents as tokens of quality and good-buy benchmarks.